Lehigh Valley, PA - Down but not out. The Lehigh Valley Phantoms rallied from a late 2-0 deficit to post an amazing 3-2 overtime victory against the Binghamton Devils on Saturday night at PPL Center. The Phantoms could not have opened their four-game homestand more dramatically. Phil Varone (4th) tied the game with just 4.5 seconds to go which set the stage for Mike Vecchione's (3rd) winning conversion in the three-on-three overtime session. It was Lehigh Valley's first overtime win of the year as the Phantoms improved overall to 6-3-2 including points in six of the last seven games in which the Phantoms boast a 4-1-2 mark. It is the second time this season the Phantoms have rallied from a late two-goal deficit to win. They did similarly on October 13 at Springfield when the Phantoms trailed 4-2 with 2:30 left before coming back to post a 5-4 shootout victory. A scoreless deadlock through 40 minutes would be broken on a pair of Binghamton Devils goals early in the third period for a 2-0 game. Marian Studenic (5th) and John Ramage from the red line (1st) scored the go-ahead goals for the B-Devils. But head coach Scott Gordon felt the time was right to take his shot. With both teams down a player on offsetting penalties, Gordon pulled his goaltender, Alex Lyon, with 6:54 remaining to set up a 5-on-4 extra-attacker situation. The gutsy move paid off in the form of Colin McDonald's first goal of the season with 6:01 to go on a deflection of a T.J. Brennan shot. Suddenly back in the game and on the scoreboard, it almost felt like the Phantoms had the Devils on the ropes even though it was Lehigh Valley that was down by a goal still. Another extra-attacker lamplighter would come to tie the game just as the Phantoms were about to run out of time. Binghamton attempted to clear the puck down and may have been trying for a long empty-netter to seal the victory but Philippe Myers incredibly kept the puck in at the blue-line with a mid-air stop with just eight seconds to go. He spotted T.J. Brennan on the right boards who quickly fired the puck to Varone for the back-door chip through Blackwood. The reigning AHL Most Valuable Player (Les Cunningham Award) sent the crowd into a huge roar and the game was onto overtime for the first time at PPL Center this season. Alex Lyon made four consecutive saves in the extra period including a couple dandies from close range to keep the Phantoms alive in the contest. Following an icing, the Phantoms came up with the puck in their defensive zone and Mike Vecchione was off to the races on a 2-on-1 with Mark Friedman. Vecchione fired the winning shot from the right circle over to the far post past the blocker of goaltender Mackenzie Blackwood for the game winner. It was the only shot on goal of the overtime for Lehigh Valley. It was Lehigh Valley's first overtime win since January 14th, 2018 when T.J. Brennan scored a winner at the Hershey Bears. Brennan registered a pair of third-period assists in the comeback of this one. The overtime win was also the 19th all-time for Lehigh Valley while Mike Vecchione becomes the ninth Phantom to score an overtime goal at PPL Center. It was the first overtime win at PPL Center in almost a year going back to Will O'Neill's winning snipe on November 25th against the Bridgeport Sound Tigers. The Phantoms went 2-0-1 in their recent three games against the Binghamton Devils that were all played within a quick eight-day stretch. Binghamton out shot Lehigh Valley 37-26. The Devils were 0-for-2 on the power play while the Phantoms were 0-for-1. The homestand continues on Friday, November 9th when the Springfield Thunderbirds swoop into PPL Center on Superhero Night. Family Value Packs are on sale for the upcoming Friday game including 3 tickets, 3 sodas and 3 hot dogs beginning at $69 with options available to add to the family value pack. Order online via PhantomsHockey.com or by calling the PHantoms at 610-224-GOAL (4625). 1st Period- No Scoring.Penalties-Bunnaman Lv (holding), 11:29; Bastian Bng (cross-checking), 14:09. 2nd Period- No Scoring.Penalties-Twarynski Lv (boarding), 4:00; Bastian Bng (roughing), 19:50; Willcox Lv (roughing), 19:50. 3rd Period-1, Binghamton, Studenic 5 (Zacha, Quenneville), 3:13. 2, Binghamton, Ramage 1 (Kapla, Studenic), 5:56. 3, Lehigh Valley, McDonald 1 (Brennan, Vecchione), 13:59. 4, Lehigh Valley, Varone 4 (Brennan, Myers), 19:55. Penalties-Gryba Bng (cross-checking), 13:06; Varone Lv (roughing), 13:06. Shots on Goal-Binghamton 10-17-11-4-42. Lehigh Valley 7-10-8-1-26. 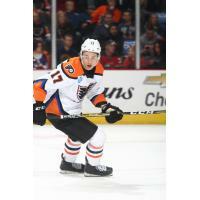 Power Play Opportunities-Binghamton 0 / 2; Lehigh Valley 0 / 1. Goalies-Binghamton, Blackwood 1-2-1 (26 shots-23 saves). Lehigh Valley, Lyon 2-1-0 (42 shots-40 saves). Referees-Michael Sheehan (74), Jason Williams (18). Linesmen-Matt McNulty (26), Jud Ritter (34). Season tickets offering a wide range of benefits as well as 20-Game and 12-Game plans and 10-game Flex-Voucher Packs are available by calling the Phantoms at 610-224-GOAL (4625).